HI, hey, look over here I have another breakfast recipe, straight from the kitchen of Gordon Ramsay. Well it’s actually from his Youtube channel. But I trust Gordon Ramsay. He’s a great cook and he makes these funny hand gestures when he explains things, like my mom. Hi, mom. 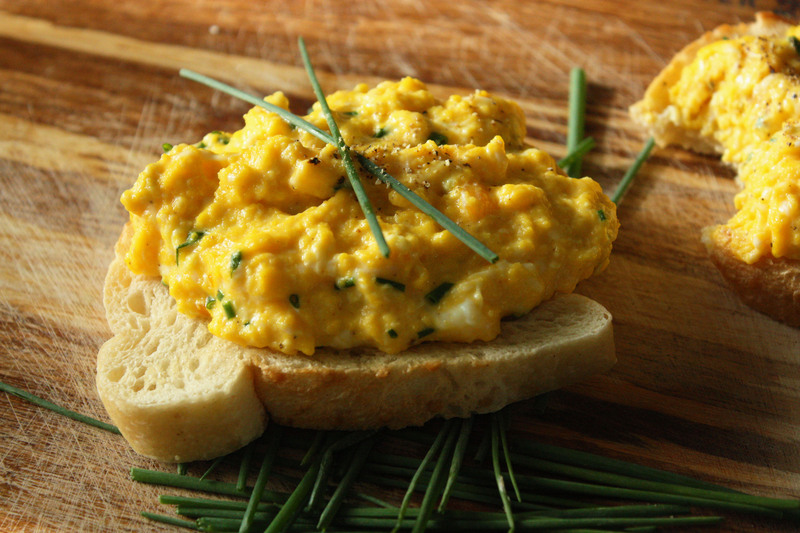 Now, most of you have had scrambled eggs… But I bet a lot of you have never had scrambled eggs like this. They are creamier, softer, and sexier than the scrambled eggs you grew up with. They are the scrambled eggs of the upper crust. 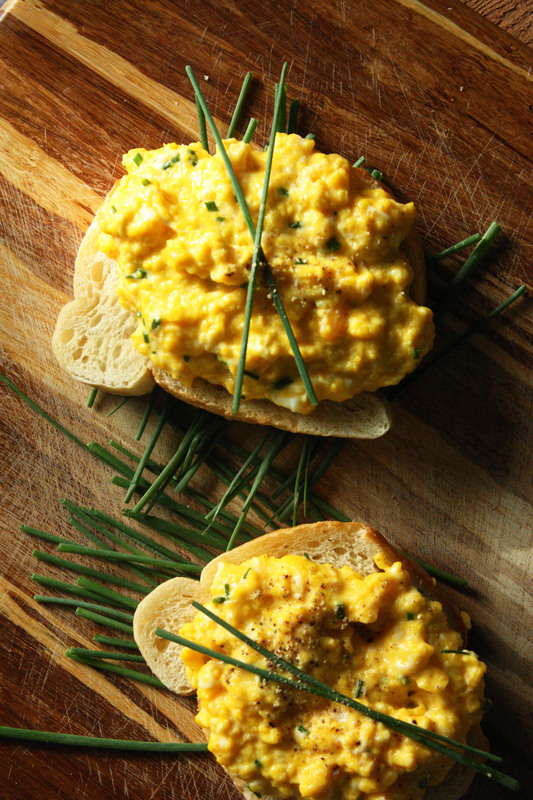 They are the scrambled eggs that Queen Elizabeth would eat. Oprah probably has had these. Maybe they’ve eaten them together? Maybe Meryl Streep cooked them as the character from It’s Complicated. And maybe Steve Martin stopped by – he’s in that movie too. But he’s just Steve Martin not a character. Maybe Diane Keaton is there with one of her hats, and then Diane Lane appears because I always mix their names up. If Richard Gere comes, will he be dragging that guy in a rug from Unfaithful or is he the rich bachelor from Pretty Woman? OMG I hope Julia Roberts comes. Jason Alexander behaved badly in that movie so he’s not invited. One time somebody told me I looked like Emma Roberts. Wait what were we talking about again? *Unlike the scrambled eggs you may be used to, these will be cooked in pot – not a pan! You will also be using a spatula, not a whisk. I know it’s weird, but just go with it. In a medium-sized pot, crack in your 3 eggs and add the butter (do not add salt yet). Transfer pot to medium-high heat and stir up the eggs with your spatula. Remove from heat, continuing to stir. Return pot to heat and stir for another 10 seconds or so. Repeat this process until the eggs have thickened just enough to keep their shape and not spread out in the bottom of the pan. Remove from heat and add sour cream, which will keep the eggs from cooking further. Plus – sour cream. Yum. Add minced chives and season to taste with salt and pepper. Serve atop buttered toast (I prefer Portofino Sourdough) and tell three friends about this recipe. They’ll love it. I love those eggs, I used to be a non- believer of scrambled eggs untill my mom made them for breakfast while visiting her in sunny Sonora, California. Really tasty way to make eggs. 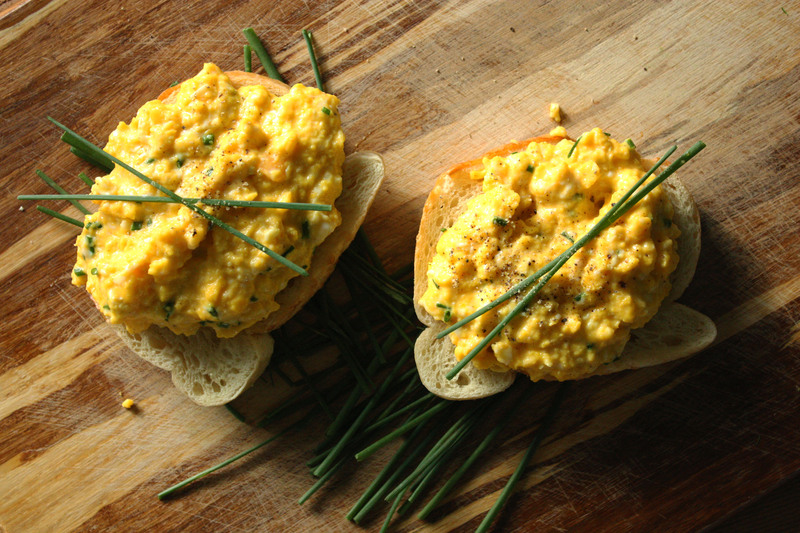 well isn’t this exciting….the whole darn family is into scrambled eggs now!!! I did not know I was following Gordon’s eggs….just for your info Katy …Gordon did one of his cooking shows right here last summer and I showed it to your dad last week when we visited there.